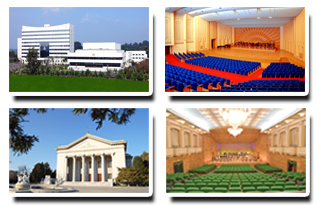 The Ministry of Culture of the Democratic People’s Republic of Korea (DPR Korea) organizes Pyongyang International Vocal Competition every two years beginning from 2018 in Pyongyang, capital of DPR Korea on the occasion of the Day of the Sun. Pyongyang International Vocal Competition has the purpose to upgrade the artistic representation of the songs from 5 “Phibada”-type revolutionary operas created under the personal guidance of the great leader Kim Jong Il and other Korean masterpieces, as well as classic and famous songs from different parts of the world. The Competition is also aimed at discovering new talented singers for their further development and promoting exchange and cooperation with different countries of the world. ※ The Organizing Committee of Pyongyang International Vocal Competition is convinced that the Competition will make a positive contribution to the development of world vocal music through competition of artistic ability and mutual exchange of experience among talented singers from different countries of the world. Under the support of the Ministry of Culture of DPR Korea, Korea Art Exchange Society invites 6 winners of Pyongyang International Vocal Competition to the April Spring Friendship Art Festival in Pyongyang for 4-5 rounds of performance.